Report: State's jobs vulnerable to automation, especially in food, retail and manufacturing. Roughly half of all jobs in Oregon are at risk of being replaced by automation in the rapidly approaching future, according to a first-of-its-kind report released Wednesday. 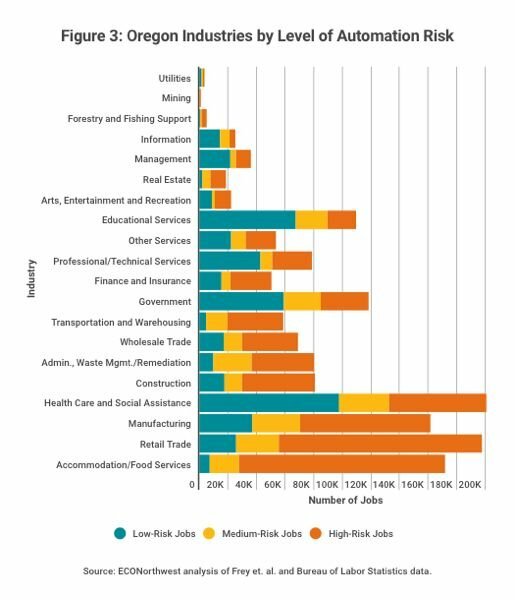 The report, commissioned by the Value of Jobs Coalition, found that lower-paying jobs requiring less education and fewer skills are most at risk of being eliminated. They potentially include 144,200 jobs in the state's food preparation and serving-related occupations — which is 93 percent of the 2016 total. Even 12 percent of higher skill health care practitioner and support jobs are at risk, says the report prepared by the ECONorthwest economic consulting firm. The report released on Nov. 29 also says that more jobs will potentially be lost in rural parts of the state. Oregon's coastal regions and Josephine County look to be most vulnerable, with almost 60 percent of jobs at risk of automation. In previewing the report with the Business Tribune, economist John Tapogna, president of ECONorthwest, said this isn't the first time America has worried about this. In the late 1960s there were great fears that we would be displaced at work by robots. However in at least one reputable report, "Their conclusion was, we are better at eliminating jobs than we are work. In that humans may figure out how to make things better, but we always desire more and more," said Tapogna. In 2017 it's different. "The pace that you are going to see automation come at you is going to be more rapid than ever. And that's why you need to sit down and think about it," and come up with preemptive policies. Even Portland is not immune from such losses. The report says 49.1 percent of all jobs here are at risk. According to the report, only the Corvallis area is predicted to do better, although 48.6 percent of the jobs there are still at risk. The report was prepared in conjunction with the Oregon Business Summit scheduled at the Oregon Convention Center on Monday, Dec. 4. "Is Oregon Future Ready?" is the announced topic of this year's annual gathering of elected and business leaders. The most vulnerable jobs to automation are in accommodation/retail, food services and manufacturing. As an example of a nuanced influence in automation, Tapogna said a skilled job such as looking at an X-ray might in a few decades be done by software. But telling the patient the results is likely to remain a human-to-human skill. The report is believed to be the first macro-economic analysis of the potential effects of automation on a state's labor force. "The next wave of automation, and the future of work, have risen to the top of economic and policy discussions," says the report, noting that 13 percent of prime employment age males in Oregon were not working in 2013. The highest percentage of those who are not in the workforce have only a high school degree or less. By coincidence, the report was released the same day as a study saying that as many as 800 million workers worldwide may lose their jobs to robots and automation by 2030 — more than a fifth of today's global labor force. The study, by the research arm of McKinsey & Co., says that could include up to 73 million jobs in America. Like the Oregon report, the study says most of the jobs at risk require lower skills, such as fast-food workers and back-office employees. Up to 375 million workers may have to change jobs, the study says. According to the report, many experts believe that job changes caused by automation are happening must faster than previous employment revolutions — and much faster than most people realize. The Oregon report calls on policymakers to begin preparing for the challenges of automation. Among other things, it says the education system needs to be improved to better prepare more students for the demanding jobs that are not likely to be replaced. It also says the state should take advantage of the opportunities created by automation by encouraging the growth of innovative companies with such attractions as more housing choices. And it says a better social safety net needs to be built for those most likely to be displaced by automation. The concept of a universal basic income is now also part of the conversation, an idea imported from Scandinavia and Switzerland. Looking at prime age males (aged 25 to 54), who are traditionally expected to work, the proportion not working is set to rise especially amongst those with high school or less education. This includes the officially unemployed, those unable to work and those who have stopped looking for work. That number is approaching 20 percent now and is set to rise if jobs such as fast food and driving are taken over by software and robots. "If I had to pick a slide that would speak to what might be which might be fueling some of the populist unrest in the country at this point I don't know of another economic chart showing this economic anxiety." Read the report at https://portlandalliance.com/automation.